The ideas behind Empire are further explained in a 45 page MFA thesis on how surreaslism can be used to create memorable brand stories. 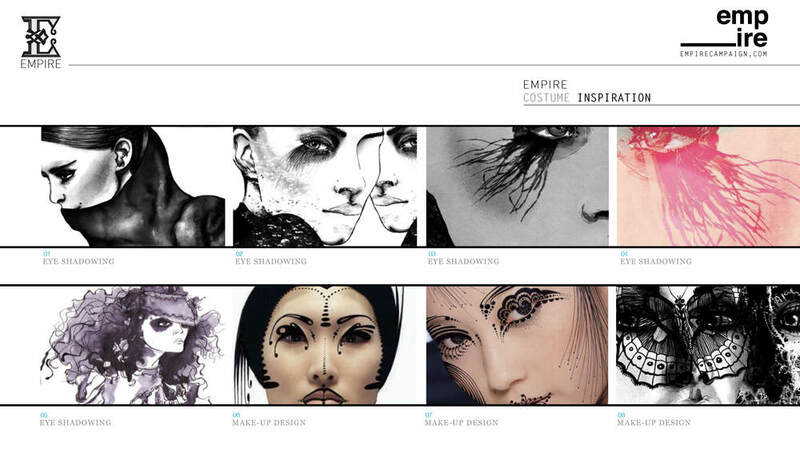 As of January 2015, Empire remains the one project most near and dear to my heart. In the beginning, Imaginary Forces Director Alan Williams and I had the notion of a fairytale and escaping the bonds of an oppressive society. We used costumes to represent conformity, vanity, pride and impermanence. The costumes ephemeral nature would force constant maintenance in order to sustain the status quo and each costume was imbued with an animal quality that would be used in a kind of mating ritual. While Alan and I were trying to create something beautiful, Empire is a statement about how fickle the notion of beauty can be. In a world where everyone is the same, beauty is only novel when there is a sense of originality. It is that desire for individuality and autonomy that causes our heroine to seek love outside her societal sphere. It is one of my favorite projects because of the ideas and hopes that it fosters and because, quite frankly, we didn't know what we were doing but we believed in it whole-heartedly. That kind of naive ambition is so inspiring about working in collaborative projects, it's a form of unspoken trust and confidence in the person to your side. Technology has changed so drastically in 4 years that I think we both know that we could have easily pulled this off today. But in 2010, time and the pressures of life were against us. It captures my imagination to this day and if my world were to change tomorrow, it would be the first project that I would revisit. 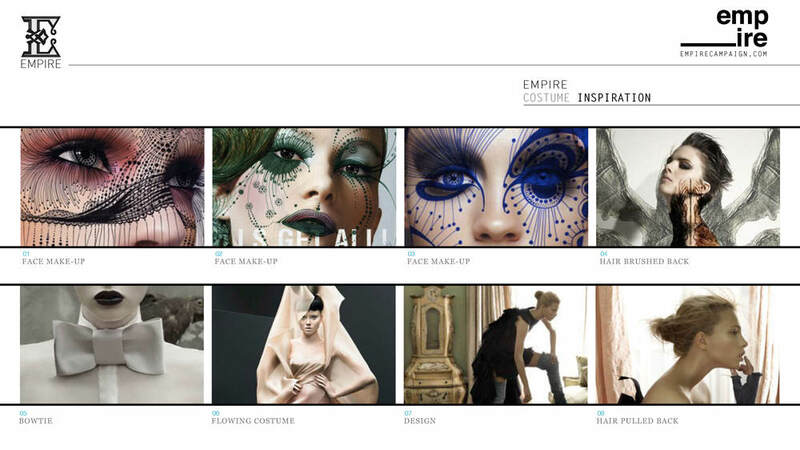 Empire is a statement about how fickle the notion of beauty can be. Empire derived from some of the imagery found in the children's book Henry In Love by Peter McCarty. 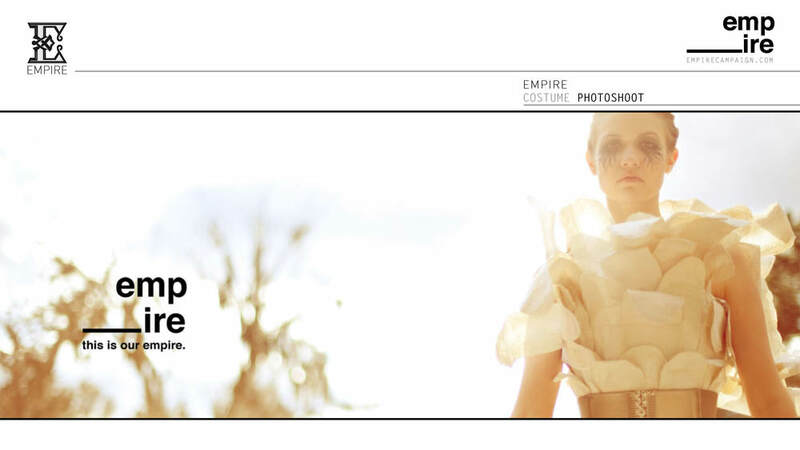 Empire was made to be two 30 second shorts for the Urban Outfitters or Levi's brand. In a world where ornate attire is an accepted generational decree, a boy, from an ancient lineage of outcasts, is forever banned from the elitist clothing of his land. In this Empire, the vain citizens' fashion begets function; movements are restrained and interactions are an afterthought. Born of a different cloth, the boy traverses obstacles on his way to school. The boy lacks the elaborate attire, the artifice of superiority, and all the restricted movement of the status quo. However, today was different than all the rest. On this day, sitting in the back of the classroom, was the Queen of this Empire. The boy became instantly enamored, her beauty dissolves the walls of the confining room. The following day a search is on for the Queen's suitor and only the most elaborate attire in the land is to be considered. Our hero watches, forbidden to partake in the courtship. Event participants line up preparing to offer themselves to the Queen. Wings flare. Costumes primped and sewn. Suitors line up to impress. Determined to win the heart of his Queen, the boy works tirelessly through the night binding discarded scraps of paper and sticks. The Queen startles the boy, their eyes meet and he is unsure of her reaction, the Queen pushes off his make-shift costume. "Costumes primped and sewn. Suitors line up to impress." Alarms blare, houses pop open and come to life. The Empire is awakened by the Queen's absence. Our hero and the Queen look at one another. The Queen knows our hero's life would be destined for dismay, she takes his hand and leads him far beyond the permitted towers to a wild place. As they run, the restrains of her costume tear, an unfamiliar feeling of freedom washes over her face. They reach the bounds of their surroundings. Light emits out of a crack in the side of a mountain, the boy can fit through. The Queen cannot fit, her costume prevents her. She looks back at the Empire, far in the distance. They look each other in the eyes. Ben puts out his hand. The end. "... SHE TAKES HIS HAND AND LEADS HIM FAR BEYOND THE PERMITTED TOWERS TO A WILD PLACE." 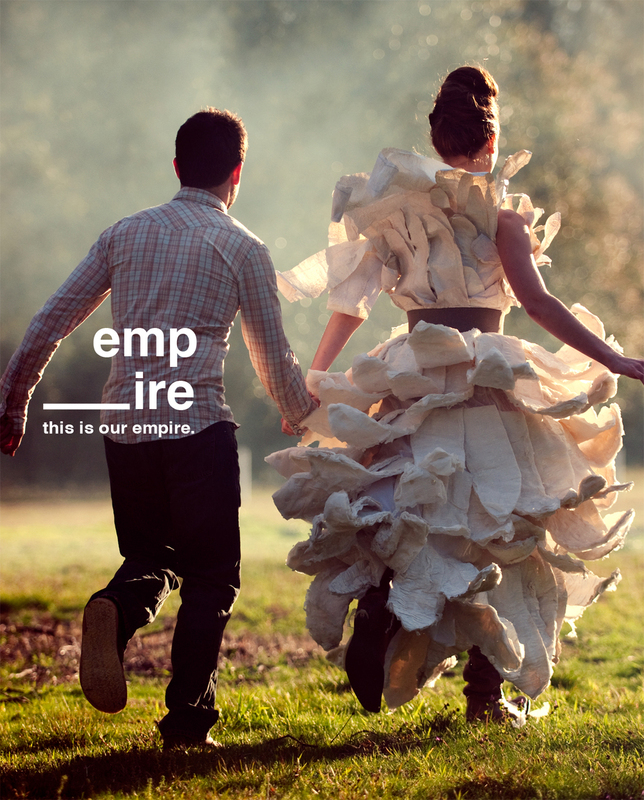 Empire is built around a fantastical fable of forbidden love. An outcast hero and a discontent Queen rebel against the rigid conventions of their land in order to be together. 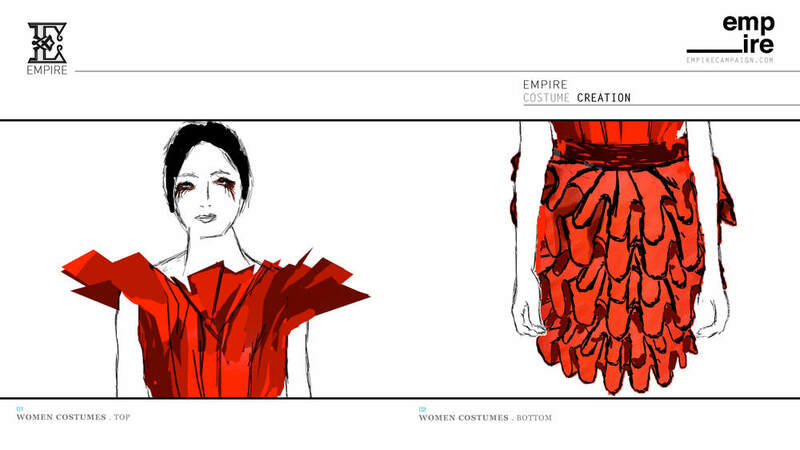 The oppressive vanity of convention is represented through delicate paper couture dresses that hamper movement. Conversely, our hero's individualism is represented through loose fitting casual clothing. Exhausted from the weight of both her enveloping costume and the expectations of the Empire, the Queen grows an attraction for our free- spirited hero that will lead them on a journey in opposition to the status quo. The campaign was developed as a unique episodic narrative that engages the viewer in a timeless vision of love's ability to transcend entrenched values. The environment is a reflection of the characters and the tenants of Surrealism by being constructed on unstable foundations and utilizing skewed dimensionality. The alternate reality defined in Empire defies causal expectation but remains consistent throughout the entire campaign. A rebellion against the empire of self-indulgant fashion and class. It is indeterminate if she will even be hinted at until the end of the first 30-second spot. Yet, she is the most ornate character. Her beauty explodes. She is liberated by the man at the end. Huge hoop skirt that has to be removed to fit through the hole. Victorian costumes might visually contrast a forest setting quite well. Victorian costumes are also the polar opposite of denim comfort. The question then becomes why do they have elaborate clothing and then live in tree houses? We could also go the Miss Havisham route and have them wearing incredibly old Victorian clothing that is somewhat tattered. The tattered Victorian clothes would visually suggest that these are the only clothes they wear and that their playful nature has worn them out. The Queen's dress was an important element to Empire. She was to explode with a kind of raw beauty. It was Alan's job and genius to add extensions to the dress digitally. The context of the time is important to remember. This was right after Spike Jonze had come out with Where the Wild Things Are. Where the Wild Things Are used costumes on actors instead of 3D animation, but it then digitally extended expressions onto the faces of the costumes to bring the characters to life. Alan wanted to make the dress larger than life, he wanted it to be this kind of unwieldy piece of clothing that requires servants to wear and maintain. So the dress evolved over a short period of time into something that more closely resembled a blossoming flower or a swan. It was incredibly durable for how actually delicate it was. All of the dresses were made with crepe paper, wire, base elastics and glue. They were an engineering feat and encumbered the actors which serendipitously aided their performance. Starting in June 2010, work began on the 3D side of model creation. The 3D models had parameters; all the models needed to have some kind of natural energy such as counterweights or wind power, and they needed to be made of wooden textures or natural elements, including an assortment of metals. Further, the environment needed to convey the idea that this was once an intelligent society that was in a state of deterioration. At the start of June a majority of the live action had been shot, the next step was to populate the footage with surrealistic houses and devices. After creating a rough cut, all the footage was imported into Adobe After Effects and rough sketches were painted directly over each shot to attain the placement and arrangement of the 3D models. This process also helped to create a blueprint to give to a compositor. The blueprint consisted of every individual shot name with timecode and frame numbers, thus giving the compositor instant reference in 3D tracking programs for matchmoving. The motion of the houses Are independently run. No animation has to be considered by anyone USing the project files. Early on in the storyboarding process one of the ideas that developed was to create houses that could open and close with the pull of a cord. These houses would work like an umbrella or a venetian blind. The operator would pull a cord and the house would collapse upon itself. This idea was incredibly time-consuming to engineer. One of the issues facing the creation of every model was how to automate the house for ease of use by a compositor. A script animates all of these models. More specifically, Cinema 4D's Xpresso system. These 3D scripts are akin to dominos. The way to tip the first domino is to create a script that says at frame one start this ‘H’ rotation that causes this ‘Z’ rotation. This starts the chain reaction. The script drives the movement of one rotation and that one rotation translates to the movement of many objects designated by the operator. Engineering rotations to translate to expanding and contracting positioning coordinates proved to be a tall order and extremely time consuming. Ultimately, this is something the viewer would never see or be aware of its occurrence. The motion of the houses are independently run. No animation has to be considered by anyone using the project files. This scripting animation process speeds up the compositor’s job and makes for much more manageable file sizes. “Unfolding House” is an example of one of these complex animating houses, everything in the house is run by a large windmill on the left of the house, the windmill spins and turns screws on the inside of the house. When a screw starts to wind, the roofing begins to unfold and cover the house. The animation of the roof expanding is staggered giving a wave-like appearance to the roof unfolding. To seamlessly allow the roofing to raise the front siding begins at a 90-degree angle and folds down to cover the face of the house. The house is built upon a barren tree whose branches have protruded through the siding of the structure. This house is a shelter with the designed purpose of bringing the outside in. “Unfolding House” is a unique blend of industrial, residential and commercial architectural elements. Starting in early January 2010 work began on the visual campaign. Before storyboarding, one of the first steps was to map out and formulate how characters could move and interact within the environment. A large tree would act as the epicenter for the Empire and also as a point of reference for each shot. Anywhere the viewer stands inside the Empire, the tree orientates viewer as to their location. The tree is an important element because it provides visual cues as to how the inhabitants of this Empire divide social classes and how they respect the environment in which they reside. The tree itself is broken and the limbs shorn off, implying a decadent society. The overgrowth and supremely large nature of the tree hark to the oversized fruits and vegetables of surrealist artist Giorgio De Chirico. The tree itself is built upon a harsh landscape of stone. The weathered landscape and the restrictive nature of the clothing required an automated system of transportation. The vain characters in the Empire must ride on rail systems to gain access to the schoolhouse atop the tree. The first thing constructed was the tree itself. It had a 4X4 inch wood armature that was cut at a 20-degree angle to cast the trunk of the tree in a position simulating movement. Two-inch high-density polystyrene foam was glued to the armature with expanding polyurethane foam. The basic shape was made using a serrated knife and a long bladed reciprocating saw. Using a grinder and a 5-inch cutting disk made the bark detail. Once the tree was shaped it was coated in an acrylic base coat to protect the foam from damage from any spray paint used from aerosol cans. The spray paint would etch the foam if it were not first coated in an acrylic paint. In order to film the model in the round it was determined to have the model table pivot around a central axis. 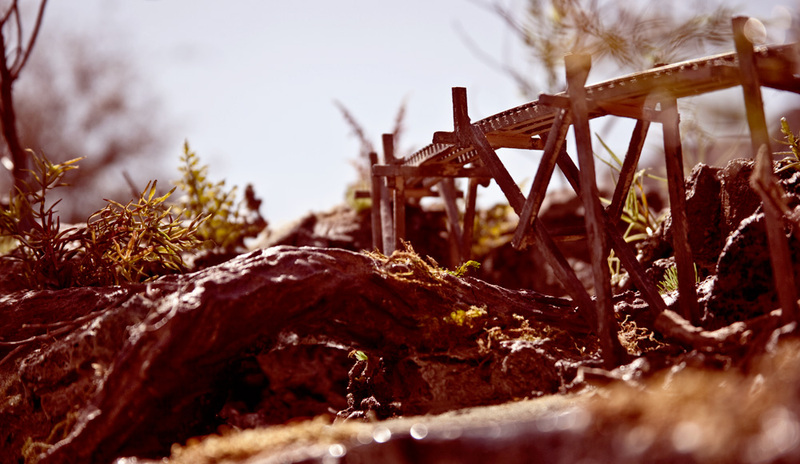 This was accomplished by using wheel bearings and roller- ball castors that provided near effortless smooth movement for filming all elements of the model. A system of electrical brushes on copper-ringed commutators provided the model with electrical current without wire entanglement when the need arose for lighting and train movement while filming. Experimentation for rock formations was complicated. After using real rock impressions in modeling clay and casting plaster in the impressions it was determined that the process not only was time consuming and costly but it lacked the desired effect. An accidental spill of lacquer thinner on a piece of polystyrene provided a result that produced the most dramatic effect of rock structure for the model. When the etching of the polystyrene subsided, an acrylic paint was applied to provide the landscape presently on the model. Real mosses, miniature ferns and lichens were glued to various areas to provide a juxtaposition of hard and soft surfaces that would lend visual interest to the environment. Other surfaces were covered with adhesive glue and either sprinkled with colored flocking or sawdust that was later spray-painted to achieve a rugged appearance. A clear epoxy resin was spread over a black acrylic painted surface to provide the simulation of water. The model was made in four segments that could be removed from the main frame of the unit for transport. A rolling base was made to provide mobility to the model, as the model would need to be moved to natural light or a location where a blue screen could be erected for filming. The tree houses were made from split popsicle sticks, 1/16-inch luan mahogany, and cereal box cardboard covered with acrylic paint. The entire model's surface was built from polystyrene foam. The interior of the tree houses have LED lights that can be lit from the same location as the track regulator. The overall presentation of the Empire model was made to mimic an excision of a plot of land from earth and placed on display for observation in a surreal setting. THE HANDMADE MODEL HOUSES AND LARGE ROTATING TREE ASSEMBLAGE TOOK ABOUT TWO MONTHS TO COMPLETE.